In stock -This product will ship today if ordered within the next 1 hours and 59 minutes. OptiBac Probiotics for Babies and Children contains high quality, well-researched live cultures. This natural supplement contains L. acidophilus with Bifidobacterium infantis & bifidum (the dominant cultures in healthy infants & kids). This product is suitable for pregnant women, breastfeeding mothers, infants and children from birth up to 12 years old. From birth onwards, `For Babies & Children` (For your child`s health) from OptiBac Probiotics can be given as a natural supplement. Having an imbalance of good and bad bacteria in the gut is thought to cause issues in digestion and immunity for infants and children, and this imbalance is what ‘For Babies & Children’ aims to rectify. 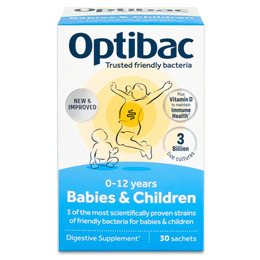 OptiBac Probiotics `For Babies & Children` is a natural supplement and is completely free from sugars, artificial flavours & colourings which can be found in other children`s supplements containing live cultures. Each sachet provides 3 billion live probiotic microorganisms + 0.75g prebiotic fibres (FOS). Fructooligosaccharides (FOS); Filler: potato starch; Live probiotic cultures (Lactobacillus acidophilus Rosell-52, Bifidobacterium infantis Rosell-33, Bifidobacterium bifidum Rosell-71). Infants from birth to 3 years: Take one sachet per day or as professionally directed. Children 4 to 12 years: Take 1 - 2 sachets per day as needed or as professionally directed. Pregnant and breastfeeding mothers: Take one sachet per day or as professionally directed. For best results, take with breakfast. Food supplements should not be given to infants under 6 months of age without the advice of a doctor. Store in a cool, dry place, and away from direct sunlight. It is not recommended to give live cultures to patients who: are severely immunosuppressed, have pancreatitis, are in the Intensive Care Unit, have blood in the stool, have central venous catheters; or to post-surgical patients with open wounds, or infants with short bowel syndrome; unless under a doctor`s care. 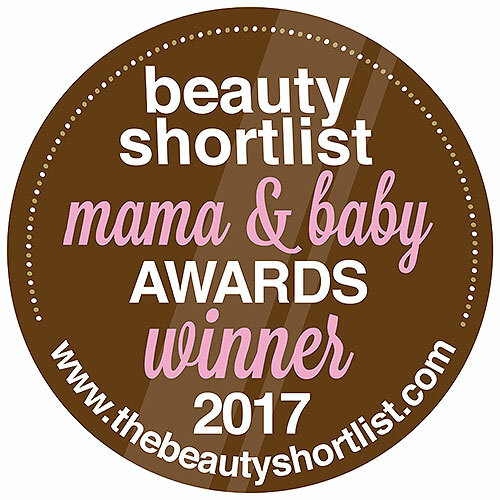 Below are reviews of OptiBac Probiotics Babies and Children - 30 Sachets by bodykind customers. If you have tried this product we'd love to hear what you think so please leave a review. Fantastic product for my lactose intolerant daughter (1 year) and my two year old who is a 'dry teether'. Change in their general wellbeing is unbelievable. I love the optibac sachets as they're easy to use and disguise in food/drink. I was advised by a dietician that my son had a lactose intolerance, saw a kinesiolist who said it was a weak gut meaning he couldn't cope with lactose, these probiotics have completely healed his gut, he has normal poos for the first time in his life!! and is back on dairy. If he catches a bug I tend to order another course to help him get back to normal otherwise he has a bad tummy for weeks after said bug. LOVE them! Really great product. Combined with a slight change of diet, the probiotics have really calmed my son's tummy and his excessive wind! My son was born with cystic fibrosis and we were given probiotics to help with his digestion. We switched quickly to this Optibac product due to it's ease of care, they are in sachet form without need for refrigeration. He has had these for 6 years now and have helped his digestion immensely. We notice immediately when he has not had it. Disclaimer: Having previously purchased this product from bodykind, I was offered the opportunity to receive a further product free of charge in return for writing an honest and unbiased review, which I have done. My son was 6 weeks premature and from the age of 6 weeks to 12 weeks he was constantly crying, constantly had wind and it was the most difficult 6 weeks ever. We tried infacol, gripe water, milk change, lactose drops and the doctors fobbed us if with colic. Upon research and coming across this product I was willing to try anything and I'm so so happy I did. The change was practically instant. After a weeks I weaned him off these and gave the sachets to a friend who was also desperate. Low and behold her 16 month old son also changed and slept through the night for the first time ever! Unfortunately my son seems to have got his symptoms back so today iv ordered more. Lesson learnt! I used this probiotic for my daughter when she was a baby to help her gut recover after a course of antibiotics. Even though I was breastfeeding I could tell from her breath that her gut had changed for the worse after the antibiotics, but this product was brilliant at getting her back to normal. I highly recommend it if your child has had antibiotics. Now she's older but I still use it during the winter to boost her immune system and when we travel abroad or go camping. It is easy to use, just add to a drink and stir, it tastes sweet and mild. I like that it does not require refrigeration so easy to take while travelling. I give these daily to my two children and has really helped with their digestion. My daughter is gluten intolerant and I was told to give her a probiotic to help her. Their health has improved too, they seem to recover a lot quicker from the sniffles etc. The powder is really easy to put into their food - I sprinkle on their cereal so they have it with no fuss and the sachet means it is easy to take with you if you are away for a night or two. I would highly recommend it. I recommend these to everybody I speak to! I think if made such a difference to her skin there must be other hidden benefits also. Having previously purchased this product from bodykind I was offered the opportunity to receive a further product free of charge in return for writing an honest and unbiased review, which I have done. I have been giving these probiotics to my 9 month old daughter for her colic, and my oh my is this product wonderful. It has helped her digestion immensely, she is far happier since taking it, and her skin has also cleared up (she used to have an eczema type rash on her limbs). There are no rubbish sugars or flavourings in it either - I am very impressed! 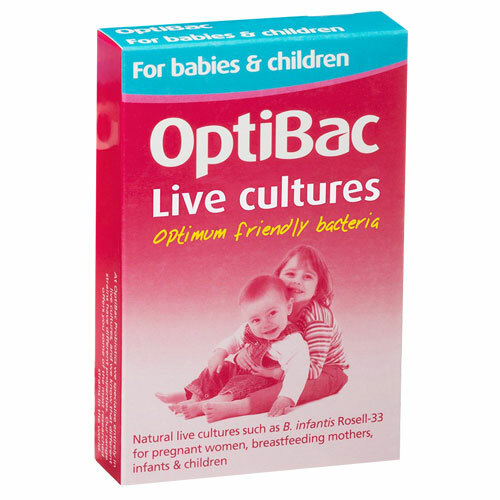 OptiBac Probiotics for Babies and Children contains high quality, well-researched live cultures. This natural supplement contains L. acidophilus with Bifidobacterium infantis & bifidum – the dominant cultures in healthy infants & kids.